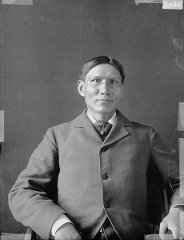 Biographical sketch at the Native Authors site. Pictures and quotations from the National Library of Medicine site. A slideshow with pictures at the commercial site World Wisdom includes pictures of Eastman and a biographical sketch. Image courtesy of the Smithsonian Institution. Note: The University of Virginia E-text Center now has free versions of Eastman's works available for download in PalmOS and Microsoft Reader format. The Soul of the Indian (1911) Google Books. The Indian To-Day (1915) Google Books. From the Deep Woods to Civilization(1916) Google Books. "Address to the Mohonk Conference" (1907) Google Books . "The Sioux Mythology" Popular Science Monthly, 1895. Google Books.